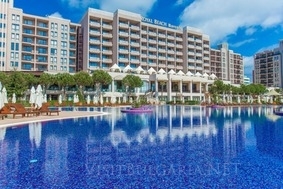 Location: Located in the center of Sunny Beach, 50 m. from the spectacular beach, 25 km. from Bourgas Airport and 60 km from the Varna Airport. Hotel Facilities: information, business centre, conference rooms, restaurant, cafe/bistro, lobby bar, pool bar, elevator. Room Facilities: satellite/cable TV, Internet access, minibar, hair-dryer, balcony.